As per the example solution below, the larger grid must be completed to ensure that the number in every black box refers to the total length of lines originating from and reaching across the grid. Bonus points for those solutions who recognise the themed (but not picture perfect) image created by highlighting all the lines of length one. E.g. 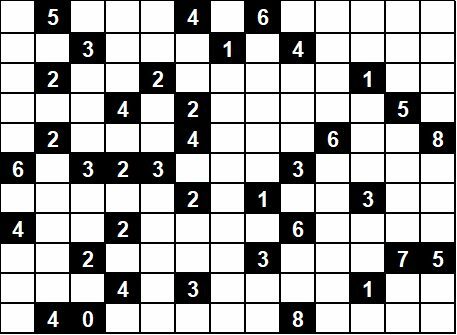 the two middle lines in the example puzzle. There were 8 correct answers submitted to this puzzle. Congratulations to Oliver Chambers, Jackie Lok, Andrew Parker, Johnny Wong, Etjon Basha, Min Chen, Sun Yu and William Ong. The winner of the book voucher is Jackie Lok. Following this strategy the expected number of bars remaining will be 479.496. One aspect of this solution that no one identified in their original submission is that the optimal value X for a given N is closely related to the square root of N. More specifically, in every case for N = 2 to N = 1000, the optimal value X is either the square root of N rounded down, or 1 less than the square root of N rounded down. Why might this be, or how might we have identified this behaviour analytically, or solved this problem in the continuous case? E(N)/N = E(N-X-1)/(N-X-1) (equation 2). E(N) = (N*X^2 – N^2*X) / (X^2 + (1-2N)*X – N) (equation 3). We want to find the value of X that maximises E(N) for a given N.
X = SQRT(N) – (N-SQRT(N))/(N-1). The second term is always between 0 and 1 (for N>=2) and therefore the optimal number to poison in the continuous case, assuming the constant ratio of E(N)/N, is always between SQRT(N) and SQRT(N)-1. So that gives some insight into what is going on. In the discrete case, the optimal number is always either SQRT(N) rounded down or SQRT(N)-1 rounded down for as far as I’ve programmed. Re death by chocolate ... the non-mathematical solution for N>100 was to remove the chocolate somewhere else first, put ten bars back in the cupboard to reduce the chance this thief suspects something is amiss ... and poison all ten. Why leave chocolate to chance?